So I had heard a lot of reviews and recommendations on the Stylpro brush cleaner. I was so astounded that people was actually managing to clean and dry their makeup brushes so quickly. So obviously I had to buy one because it would literally save me a whole day waiting for my magic wands to dry. So I ordered mine off of feel unique for £49.99 and I can honestly say it is the best £49.99 I have ever spent in my life. I was so excited for it to come and as soon as it did I literally ripped open the parcel when I got home from work and then started looking at how to use it. It comes with eight silicone collars that slot on to your brushes. At first I was a little worried about the sizes because I thought there wouldn’t be the right sizes for every brush I own. Although I was pleasantly surprised that the range of sizes was actually quite a lot. The only brushes I have that didn’t really fit into one of the collars was my real techniques bold metal brushes because they was too thin. However all of my other brushes fitted perfectly into them. The Stylpro was so easy to use. All you have to do is put some of the solution into the bowl with a little bit of water and then you find the collar that best fits your brush. It is best that you use one that is really tight so that your brush doesn’t slide out when it is spinning really fast. Also you don’t have to use the Stylpro solution although I do recommend it because it does get all of the dirt out of your brushes. 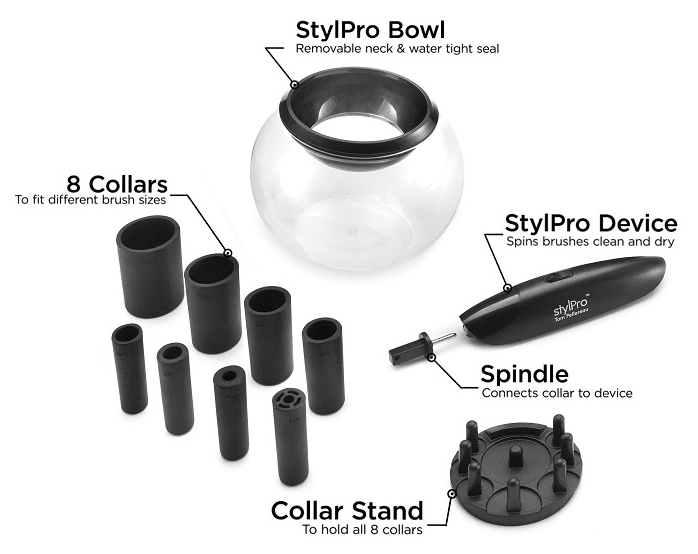 So then you literally just slot the collar all the way onto the Stylpro device that has the attachment spindle on it and you are good to go. Personally I love this device because it really does work so well at cleaning my brushes and when I want to dry them I just lift the device with the brush above the water and keep it spinning for about 10 seconds and then bam. Nice dry brushes that I can use straight away. I think what makes this product amazing is that sometimes I literally have to wait about 24 hours for my brushes to dry. Which doesn’t help when I am aspiring to be a makeup artist. So this comes in handy so much and I have used it even whilst doing makeup for clients. Because the brushes really do dry that quickly and it keeps them sanitary. Overall guys I suggest that you really do go out and buy this because it is amazing and I have never looked back on buying it. It saves so much time and effort. And I love it.